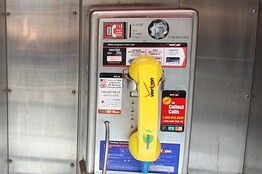 Marketing Strategy Musings - Strategy Dude (Edmund Wong's blog): Smartphones, Pay Phones, Phone Books, Oh My! Smartphones, Pay Phones, Phone Books, Oh My! Mary Meeker presented her latest state of the Internet report at Web 2.0 today. No surprise mobile Internet usage and smartphone adoption is growing like gangbusters! It is fascinating to look at this relative to some other recent developments. Last week, the Wall Street Journal reported a small California company named Pacific Telemanagement Services was buying nearly 50,000 pay phones from Verizon Communications. Also, only about 425,000 pay phones are left nationwide, down from a peak of 2.2 million in 2000, according to the American Public Communications Council. Again, not surprise due to the rise of mobile phones. But it is peculiar that PTS thinks there is a profit to be made to maintain these old phones. For the past decade or so, I have recycled my annual print Yellow Pages phone book. Instead, I have been searching online when I needed to look up something. For the past 2 years, I have been doing more of these online searches on my smartphone. This trend continues to grow as Google says about 1 in 6 searches are mobile. I stopped getting the White Pages long ago. Thanks goodness! (Tree huggers, rejoice!) 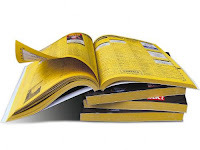 So, why do we still get print Yellow Pages? It's because the companies that own these print publications like AT&T and Idearc are maintaining the declining cash cow ad revenue while trying to make the shift to their Internet Yellow Pages (IYP) directories as quickly as possible. But IYP revenue is still smaller than the print directory business. Still, it would be great to opt-out of these phone books. We have do not call lists, do not mail lists, we can request e-bills to replace paper bills...we can send man to the moon! Why can't we have a "do not mail me a Yellow pages brick" list?!? !